This post is dedicated to Kikay Moms. Traveling with kids can sometimes be very stressful, whether the little ones are toddlers or babies. But moms need not to lose their poise and get robbed of enjoying their travel time with the family. One thing to make sure to bring with you is an infant travel bed. These little helpers are readily available in the market. Make sure what you get is the light weight type. You won’t have a need for that extra weight, believe me. Going as light as possible is the way to go. Like this travel bed for instance. 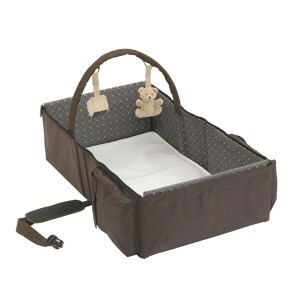 This type of infant travel bed makes for a convenient travel companion. Its size is recommended for infants from newborn to six months. It has large side pockets that can be handy to place in your diapers and other baby essentials. The collapsible frame spells portability. This will prove to be a must have for those traveling with infants. Isn’t it just the sweetest that they come up with these baby stuff that make life easier for us? I totally love it that we don’t lose ourselves when we become mothers but rather immerse ourselves in the dynamics of motherhood which is a beautiful part of being a woman.